What is Short-Circuit Current Rating (SCCR)? Simplified, SCCR is the maximum short-circuit current an electrical component can withstand without causing a shock and/or fire hazard. SCCR for industrial control panels is generally determined by the SCCR rating of all the components within an industrial panel. The overall rating of the control panel must take this into account because the lowest rated component will determine the overall rating of the panel. Three criteria are important to comply with SCCR. 1) The SCCR rating of the panel needs to be greater than or equal to the available fault current determined. 2) The available fault current must be at the customer facility where the panel will be integrated. 3) SCCR for control panels is equal to the lowest SCCR value of any component within the panel or branching components. SCCR is important for the installation of industrial machinery and electrical panels in facilities. If this rating were to be ignored there could be significant risk of catastrophic equipment and component failure, putting workers at risk. Industrial control panels cannot be installed where the available short-circuit current exceeds the panel’s SCCR. Therefore it is necessary to calculate the maximum SCCR that is present where the industrial panel will be installed. The available short-circuit current must be less than or equal to the marked SCCR. 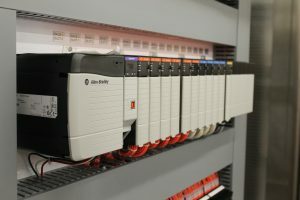 UL 508A, the UL Standard for Safety for Industrial Control Panels, and the National Electrical Code (NEC) requires industrial panels containing power circuit components to have SCCR markings. Panels that require these markings typically supply power to motors, heating elements, lighting, or industrial appliances. If a panel does not contain any power circuit components, then the panel does not need to have this rating labeled on the panel. These safety labels are just as important as any other safety label. In an age where companies spending large amounts of capital trying to mitigate risk and keep employees safe, SCCR is more important than ever. Going forward, panel builders will play a vital role in making sure industrial control panels are rated correctly.